Ken Murray retired as president of J. M. Schneider Inc. in Kitchener, Ontario after building a professional legacy that includes serving two terms as president of the Canadian Meat Council and serving on the boards of Canada Trust and Dominion Life. He was also a 33-year member of the board of directors of Homewood Corporation, serving as chair of the board from 1987 to 2000. Ken has also established a strong track record as a community leader. He has been a member of the board of governors of the University of Guelph, his alma mater, and was the first president of the Kitchener-Waterloo Community Foundation. He was also the founder and chair of the Homewood Foundation. Ken’s contributions are particularly strong in the field of aging. He is the founder and patron of the Murray Alzheimer Research and Education Program (MAREP) at the University of Waterloo and a former member of the board of directors of the Schlegel-UW Research Institute for Aging (RIA). 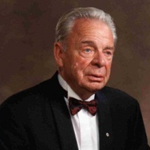 A member of the Order of Canada, Ken is an honorary fellow of the University of Guelph and he has received honorary degrees from the University of Guelph and University of Waterloo.